We received the items below for the purpose of this review. No monetary compensation was received and all opinions are my own. What darling little piglet captures children's attention and brings their imagination to life? Peppa Pig, of course! We're big Peppa Pig fans here at our house, and have been for quite some time. The animated television show follows the daily adventures of Peppa, a loveable, energetic little piggy who lives with her brother George, Mommy Pig and daddy Pig. Peppa lives in the U.K. and speaks with a sweet and engaging British Accent. They are always playing games, dressing up, going on trips and jumping in muddy puddles (of course, what piggy wouldn't?)! Peppa Pig airs on Nick Jr., check your local listings for times. 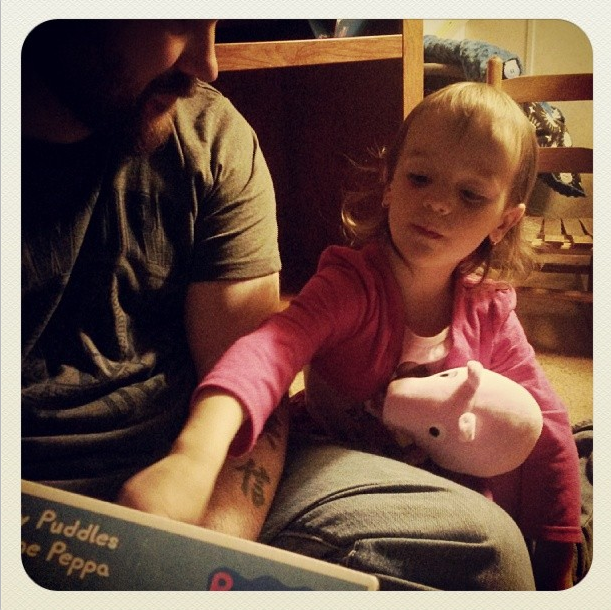 Of course, the littles don't just want to watch Peppa...they want to play with her, too! 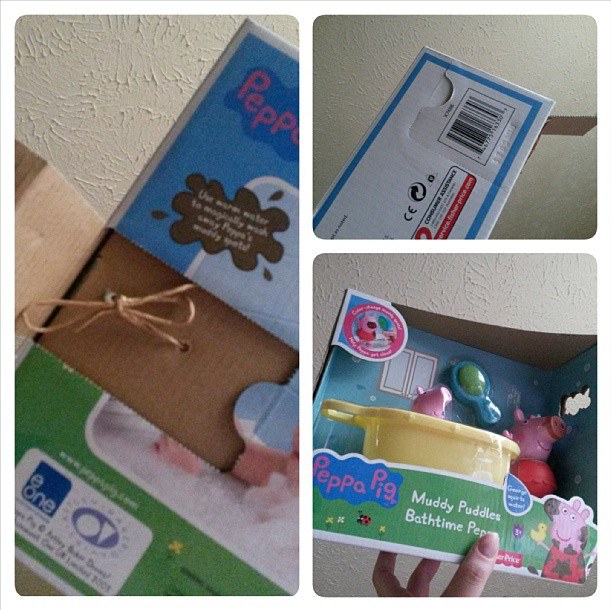 Annabelle loves Peppa Pig the most, and she was thrilled to get to play with some new toys sent our way! We received Bedtime Peppa, Muddy Puddles Bathtime Peppa, and the Peppa Pig and the Busy Day at School. Annabelle adores her Bedtime Peppa. This plush piggy is by Fisher Price and sings lullaby songs, oinks and plays a counting sheep game. It is available at Toys R Us, in stores and online, and will cost about $26.99. Above, you can see Annabelle listening to Peppa sing (although you definitely do not need to lay on Peppa to hear her...). Peppa's cheeks light up when she sings and talks, which is nice during the night. 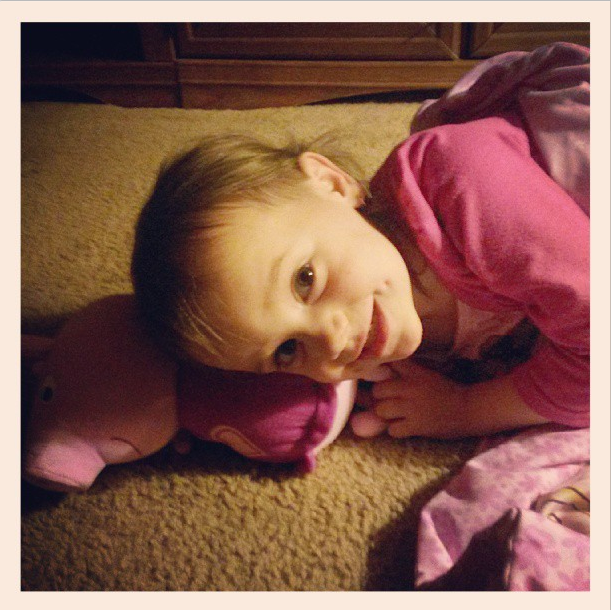 Peppa is Annabelle's newest favorite night-time buddy! Annabelle was also very excited about the Muddy Puddles Bathtime Peppa. See, Peppa played in a bit of mud, and now she's a tad dirty. Kids get to take a nice warm bath and help Peppa and George get clean! Careful of George though, he might squirt some water from his nose if you squeeze him! This toys is available from Toys R Us stores and online. *MY* favorite part about this toy... it is easy to open. If you've ever been a parent on Christmas morning (or any other day that a kid gets a lot of presents), you've probably found that your fingers hurt from all the twist ties and finagling of packages. This toy was a pleasant surprise! You don't have to tear open the whole box! You can just lift the flaps and untie the PAPER ties. Then just remove the plastic that covers the tub and brush. SO much easier than most toys! 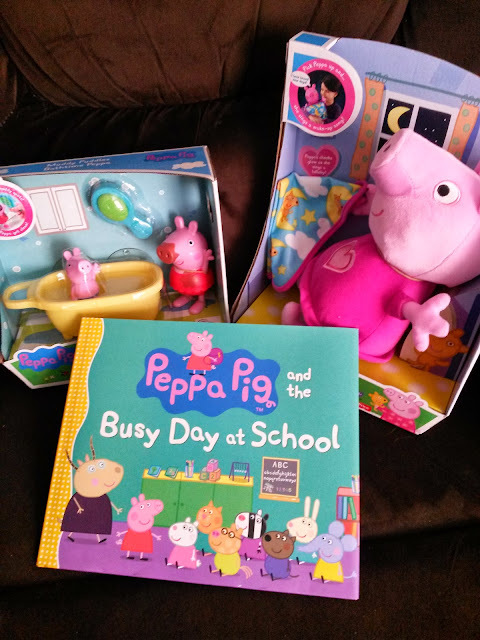 Peppa Pig and the Busy Day at School is a beautiful 32 page hardcover book from Candlewick Press. Follow the adventures of Peppa and friends at school as they learn numbers, letters, and enjoy special talent time. This book is available at Toys R Us and select booksellers for $12.99. Overall, we had a lot of fun with these products and we were very impressed with the quality and ease of use. Peppa Pig will continue to be a favorite in our house.